Sakura and her class go on their summer trip to the ocean. While Sakura is overwhelmed with joy to be at the ocean, she receives strange vibes from a cave on the beach. Her fear is worsened as she discovers this is the location of the class's courage test. The test requires students to enter in pairs and light a candle inside the cave. At bedtime, Naoko regales the other girls with stories of how another group of students just like went into the cave for their courage test and never came out. Sakura is so worried about this story, she leaves the cabin and walks down to the beach. Syaoran is also out walking and surprises Sakura who collapses in a mixture of fear and shock. Li-kun reveals to Sakura that he felt something strange inside the cave and went to investigate, but could not determine the cause. As they talk, he notices a fuzzy blue outside the cave. He tells Sakura about it, and she squeals. After they leave, the light re-appears in a much larger form. The next morning Sakura watches the cave and sees the light again, but thinks her eyes must be playing tricks on her. That evening, the class heads down to the cave. 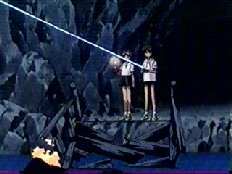 Sakura and Tomoyo enter the cave together and are soon startled by a teacher dressed as a ghost. Tomoyo is unafraid and unmasks the teacher. Sakura cries until she realizes his true identity. As the walk further in, Tomoyo notices something is wrong because despite the fact that many students have entered before them, they pass no one exiting and they have not encountered any more teachers. As they discuss this, they hear their friends screaming 'Naoko-chan!' Running forward, they find Rika and Chiharu who tell them Naoko disappeared before their very eyes and then disappear themselves. Moments later, Tomoyo disappears as well. The candle she was holding falls to the bridge and sets it alight. Syaoran rounds the corner and tells Sakura to search her feelings. Following his instruction, she senses the aura of a Clow Card. Using the Lasin board, they are able to determine the card is across where the bridge was. Sakura uses Float to lift herself and Syaoran across the water. Just as they land, Syaoran starts to disappear. He orders Sakura to concentrate and find the card. Locating it in a wooden box, she pries it open and changes the card back to its true form: The Erase. Everyone is restored, though they have no memories of the time they were erased. To erase objects and people from existence. The effect can be temporary or permanent.